Justin Trudeau led his Liberal party to victory in last October's Canadian federal election by branding himself as the champion of "change" from the decade-old Harper Conservative government that most Canadians wanted to be rid of. "Change" was promised on almost everything; from taxation to environmental policies to new relationships with indigenous peoples and much more. "Change" was also the message on several international matters with promises to increase the numbers on Syrian refugee resettlement from 10,000 to 25,000 by the end of 2015 and a promise to end Canada's combat mission in Iraq. The commitment to increase the number of Syrians resettled in Canada was a blatant case of political one-upmanship on Trudeau's political rivals and, as subsequent events would show, it was made without considering the operational realities of what was necessary and if it was even possible. This has been made clear since the election, as the supposed deadline of 10,000 persons resettled by the end of December was missed, the costs of the initiative rose from $250 million to $1 billion and the new arrivals are stuck in hotels as the community readiness and support is not what was assumed. When it became apparent that the original targets would not be met, the government indicated that to expedite the process, screening would be done post-arrival. Fortunately, the operational people at the Royal Canadian Mounted Police (RCMP), Canada Border Services Agency (CBSA) and Canadian Security Intelligence Service (CSIS) appear to have persuaded new Public Safety Minister Ralph Goodale that, to put it mildly, this would be unwise. The result was deployment of Canadian personnel in Lebanon and Turkey to assist in the screening and creation of biographical and biometric data which was shared with the United States for input before approval and departure of the refugees for Canada. This cross border co-operation was only briefly mentioned, but was confirmed in a Jan. 20 letter from the Canadian ambassador to the United States at Senate Homeland Security Committee hearings into Canada's Syrian resettlement program. In short, appropriate security measures have been taken to address the legitimate concerns created from a politically-motivated policy. The second major international policy issue on which Trudeau committed to change involves Canada's role in fighting the Islamic State in Iraq and Syria (ISIS). The previous government joined the U.S.-led coalition and was contributing six fighter jets for air strikes against ISIS as well as supplying aircraft for reconnaissance, targeting and refueling. Canada also deployed 600 military personnel as part of the joint Iraq Task Force with an additional 69 personnel in a "Train and Assist" mission to help the Peshmerga in the Kurdistan province of Iraq. A year before the election, Trudeau gained national attention (to put it politely) when he gave a bizarre interview in which he mocked Canada's participating in airstrikes as some kind of macho "whipping out our [fighter jets] to show how big they are." He was rightly mocked for his vacuous remarks at the time but the die was cast and pulling out of the combat mission became Liberal mantra during the election. Once elected, the challenge became how to achieve it without causing serious damage to Canada's international relationships and to maintain some semblance of credibility domestically. Trudeau made a wise choice in selecting Harjit Sajjan as Canada's new defense minister. Sajjan is a former Vancouver Police officer who also served three tours with the Canadian military in Afghanistan, where he specialized in developing on the ground connections to support intelligence led operations. He has also had to stoically stick to the script that "change is coming" while the details were being worked out and the national media became increasingly skeptical. 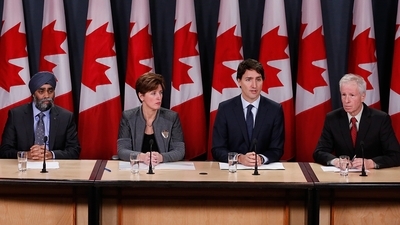 On Monday, co-incidentally while Parliament was adjourned, Prime Minister Trudeau, flanked by Minister Sajjan and the less-than-inspiring Foreign Affairs Minister Stephan Dion, released the plan for 'change' in Canada's ISIS strategy. Withdrawal of the six Canadian fighter jets from the bombing mission by Feb. 22. Maintaining aircrew and support personnel for one refueling aircraft and up to two aerial surveillance aircraft. Tripling (to 210) the number of Canadian Forces members helping train local ground troops (in Kurdistan). Adding 230 Armed Forces members to the Joint Task Force-Iraq. $840 million in humanitarian assistance over three years. $270 million over three years to "build local capacity" in Jordan and Lebanon to help them deal with refugees. An increased diplomatic presence in the region. Trudeau's plan got polite "support" from Canada's major international allies, including, most importantly, his intellectual soulmate, Barack Obama. Domestically, there has been recognition of the potential value in helping Jordan and Lebanon financially and in significant "humanitarian assistance" funding, although it will also be advisable to ensure these funds are not used for smartphone upgrades or paying for human smuggling into the European Union. The biggest question is how these measures can be honestly described as ending a combat mission. Trudeau's claimed moral aversion to bombing in Iraq and Syria apparently doesn't include conducting air surveillance and refueling for other countries to conduct the bombing. It also seems somehow to conclude that expanding the training and assisting of local ground forces to fight ISIS is not part of a combat mission. It is worth noting that the new policy does not include funding for Turkey, and that the increased military training that is being provided to the Kurds to whom the Turks are openly hostile and who are likely headed towards independence from Iraq and Syria. Stay tuned because nothing is ever certain in the Muddle East. Domestically, however, "change" can now be claimed in Canada's ISIS strategy as politics has trumped pragmatism. Harjit Sajjan's name was incorrectly spelled in the original version of this story. We regret the error. Scott Newark is a former Alberta Crown Prosecutor who has also served as Executive Officer of the Canadian Police Association, Director of Operations to the Washington D.C.-based Investigative Project on Terrorism and as a Security Policy Advisor to the Governments of Ontario and Canada. It is very small comfort to know that we Americans aren't the only electorate either stupid enough or perverse enough to choose a leader who is hell-bent on committing national suicide. Wasn't it the British historian Arnold Toynbee who once said that great civilizations don't die; they commit suicide? There is much that is good in this article, including its qualifying as "political" the Canadian government's electorally based decision to open the country's doors to an enormous influx of 25,000 Syrian refugees. (Some say that this was to win over the votes of a Canadian Muslim population that had doubled in a decade.) But it is surprisingly inaccurate to declare with such finality, in relation to the Canadian government's security screening of its Syrian newcomers, that, "In short, appropriate security measures have been taken to address the legitimate concerns created from a politically-motivated policy." To be sure, this is the position embraced by Canada's Trudeau government, in its Washington Ambassador's January 20, 2016 letter to the US Senate Homeland Security Committee, and by the Obama Administration, itself. (President Obama is pushing for a US intake of 10,000 Syrians, so the latter position would be expected.) Nonetheless, it is unclear why the article accepts at face value assurances in the Ambassador's letter that extensive Canadian screening of refugees and querying of databases will provide reasonable guarantees of safety for Canada and, by extension, its southern neighbor. Intelligence specialists know better. Those accepting the Canadian government's line miss the entire point of the long-running discussion about the relevance of databases in the screening of people coming from countries, like Syria and Iraq, where record keeping is non-existent, deceptive or similarly unreliable. As FBI Director James Comey famously pointed out in testimony before the House Judiciary Committee, last year, if you are trying to screen someone who has left behind no "ripple in the pond" – no record – you will have intelligence gaps. A few gaps among 25,000 people could mean a lot of trouble, especially should those people be rushed into Canada in the planned four months. This issue was discussed extensively by US border services' union representative Dean Mandel, Canadian immigration and refugee lawyer Guidy Mamann and Canadian national security and intelligence specialist David Harris, in their recent appearance before the Senate Homeland Security Committee. Consistent with the norms and thinking of informed intelligence professionals, all three expressed misgivings about the pretense of reliability of screening in the Syrian context. In fact, the debate immediately spread into Canada, where the hearings, and these witnesses' views, were widely reported and the subject of vigorous national debate – a key reality not reflected in this article. The hearings were even covered in Britain, which country, much more populous than Canada, is to accept fewer Syrian refugees, and those, over a period of years, not months. Likewise, the article seems to invoke the Canadian Ambassador's claim of US-Canadian intelligence cooperation on the Syrian refugee file, as though this were a game-changing, tailored innovation clinching the security question. However, an informed look at the Ambassador's list of cooperative efforts suggests little that is profoundly different from what has been the long-developing US-Canadian intelligence practice. Finally, the article asserts that Prime Minister "Trudeau made a wise choice in selecting Harjin Sajjat as Canada's new defense minister." Leaving aside the fact that his name is actually Harjit Sajjan, those genuinely attuned to operational Canadian defense, security and intelligence, would know that there were adverse rumblings, from the beginning, in the bowels of Canada's Department of National Defence and elsewhere. Some of this would have been unfair to Afghan-vet Sajjan. In fact, a good deal of this reaction may have to do with the fact that the Prime Minister had appointed as his defense minister, an individual who had only just retired from a military position considerably lower, in rank, than those senior officers who would wind up reporting to Minister Sajjan. It is probably reasonable to say that, whatever Sajjan's credentials, the issue of "jumping-up" raised fundamental questions among military professionals about the prime ministerial judgment that made the promotion of this "wise choice" possible.